Before we explain what a letter of interpretation is, it will help to step back and explain what an OSHA standard is. An OSHA Standard is an occupational health and safety rule or regulation (or a set of rules/regulations). OSHA standards occupational safety and health rules for general industry, construction, the maritime industry, agriculture, and recordkeeping. Go to this OSHA website for a complete list of OSHA standards. 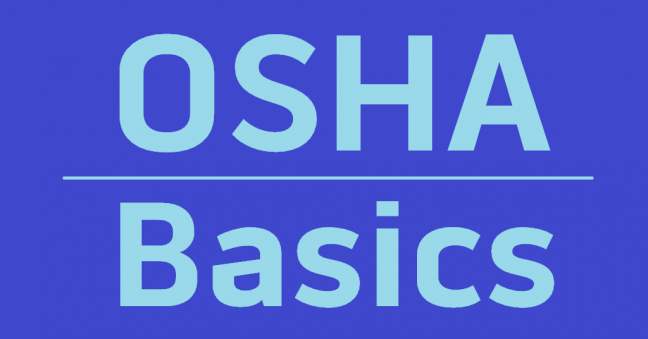 The basic idea behind these OSHA standards is that an employer should read the standard relevant to the employer’s workplace, and then follow all the rules and suggestions in the standard to create a safer, healthier workplace. But because OSHA standards are written for a wide audience, it’s sometimes difficult to understand exactly how to interpret a standard and/or how to apply it in specific circumstances. And that’s where letters of interpretation come in to play. …provides supplementary guidance that clarifies how to apply to a specific workplace situation a policy or procedure disseminated through the Code of Federal Regulations or the OSHA Directives System. An LI may not interpret the OSHA Act, or establish or expand OSHA policy. LIs may answer questions posed by OSHA, employers, employees, or other parties. Where Can I Find These Letters of Interpretations? OSHA has created a website that lists all of the letters of interpretations (LIs). This list is handy because you can click the different tabs at the top to see the LIs listed in order of their publication date (going from way back in 1972 to the present) or see them listed in order of the standard number that they interpret. So that can be pretty handy. 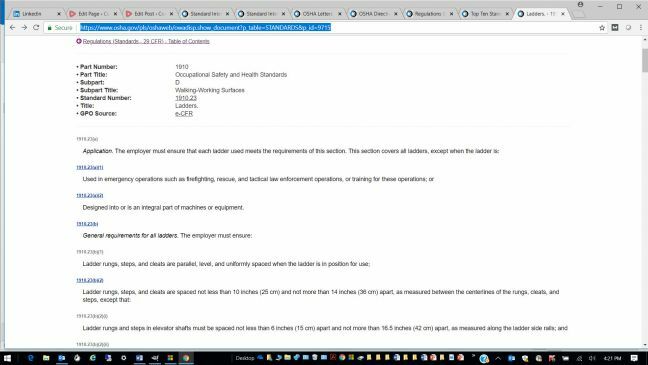 In addition to the lists of LIs mentioned above, if you go to OSHA’s website where they print all of the regulations online, you’ll see that some of the standard numbers are displayed with blue underlines. These blue underlines are web links, and they signify that the standard has one or more letter of interpretation associated with it. 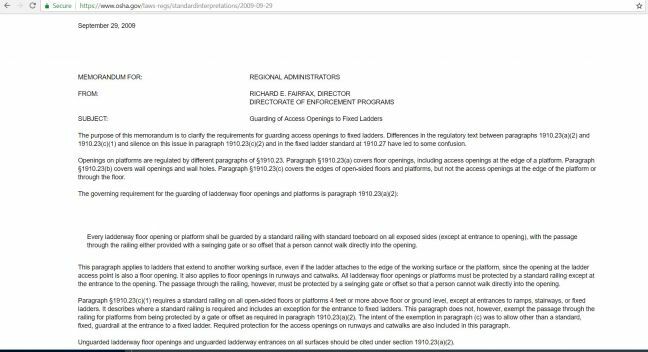 See the image below to see that blued underlined numbers in the 1910.23 ladder safety regulation as an example of what we’re talking about. If you click one of those blue underlined/hyperlinked numbers, you’ll see a list of LIs that relate to that rule. For example, if I click the underlined 1910.23(a)(2) link, I see that there are two letters of interpretation. See the example image below. And click one of those two links and you’ll see and be able to read the actual letter of interpretation, as shown below. And that, in short, is what a letter of interpretation is. Hope that helped! 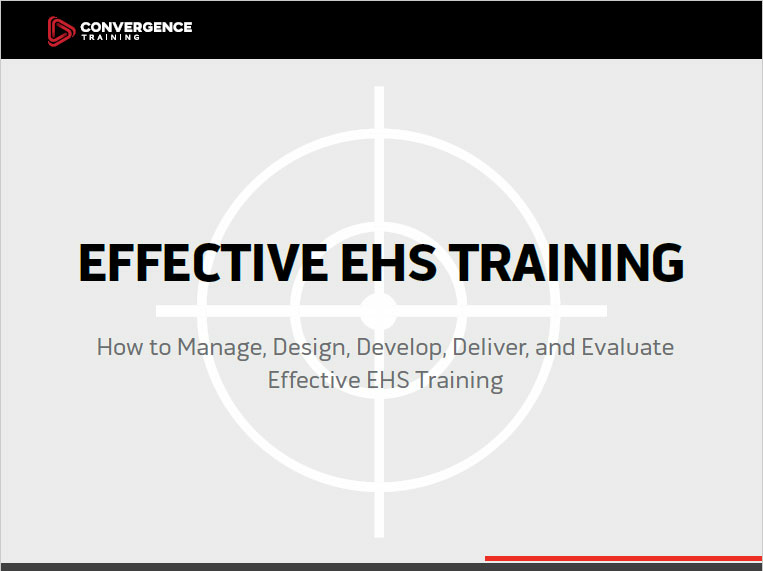 And before you leave, download our free EFFECTIVE SAFETY TRAINING GUIDE, below. I appreciate this explanation in relatively simple, understandable terms. I have heard the term and had a basic guess of what it meant but I now have a more thorough understanding. Glad that worked out for you, Mick. Have a great day.